Spoiler Free Synopsis: Narrated by the magical talking tree, Tangaroa, the Enchanted Tiki Room welcomes a few special guests to their own private island each week. Over the course of the week these tales include the famously forgotten actress, Agnes, and her dog Alfred, the money-can-buy-us-happiness Randy family, the unlucky in love, Wally, the volunteer host for the show, Chip, and Saoirse, a little girl who just wants her father’s attention. Each family or individual are in need of something, whether they know they are searching for it or not. Whether it is love, trust, freedom, or self-worth, the island has something to teach each guest. And the winged inhabitants are not immune to the problems plaguing their guests, or the significance each tiki bird has to one another. When the show starts to crumble and the lava starts flowing, will the lessons learned be enough to save them all? 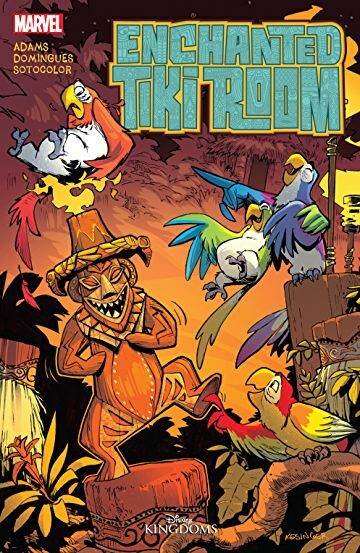 Disney Source Material: Walt Disney’s Enchanted Tiki Room is, unsurprisingly, the main source of inspiration for the Enchanted Tiki Room tale. More specifically, with its garden filled with an array of tiki gods, including Tangaroa, this story is prominently drawn from Disneyland’s 1963 version of the attraction. The story of this attraction is legendary, from Walt Disney’s fascination with a mechanical bird in a cage toy that gave him visions of a dinner show, a show that would eventually drop the idea of including a meal and become the Enchanted Tiki Room attraction with not only singing feathered friends, but also drumming figures, singing tiki gods, and crooning flowers. While the Disneyland version of the attraction is the primary muse for the story, there are other Adventureland staples to be found within these pages. Not the least of which is the Magic Kingdom’s Little Orange Bird from the Sunshine Tree Pavilion. While no Citrus Swirls were served or harmed during the making of this comic, the Little Orange Bird does have a substantial role in the story, giving both coasts’ Adventureland some skin, err, feathers in the game. Marvel Storytelling: If the tale told in the synopsis above leads you to consider the television show Fantasy Island, you would not be alone. It is clear that the story and morals presented in John Adams’ comic were directly inspired by the show that ran from 1978-1984. 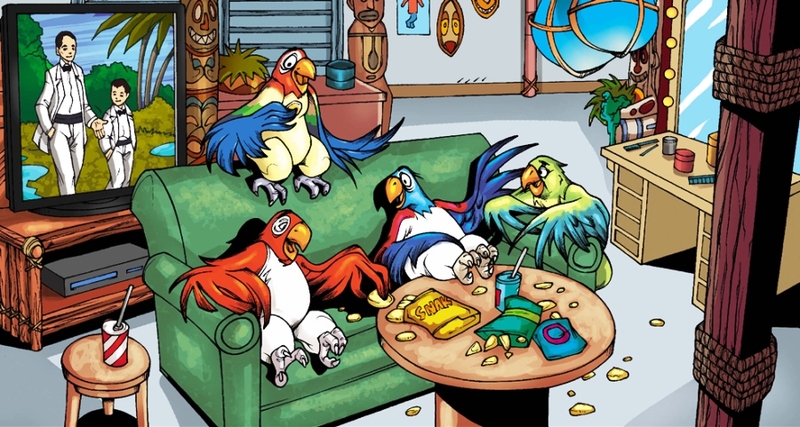 In fact, eagle-eyed readers will even be able to spot Fantasy Island's cameo playing in the background of the tiki birds' dressing room. Given the task of taking a cabaret show featuring birds, flowers, and tiki gods and giving it a backstory and plot is not an easy task, and the cracks show here early. Flipping between no less than half a dozen stories contained over the course of five comic issues makes it very difficult to become attached to the characters or to keep up with the current location in their individual story arcs. The art team is headed by Horacio Domingues who does an excellent job translating well known locations and characters to the page. Domingues is backed up by a deep bench of artists including Sotocolor (colorist for issues 2-5), John Tyler Christopher (background design art), and Brian Kesinger (cover artist), and this doesn’t even begin to touch the wealth of variant covers and the artists tapped for them. The vibrancy of the tropical island is clearly captured in each panel, which can be tricky considering just how much green is to be found in a jungle. Bonus Time: Here is where things get a little more disappointing. Previous volumes had included letters from a who’s who at Disney or Marvel, or both, to talk about the experience of putting the story together or tales from the namesake attraction’s history. In Enchanted Tiki Room, however, there are no such stories to be shared. Additionally, the wealth of variant covers, while amazing in their own right and handled by such artists as Jason Grandt, Jody Daily, and Tom Morris, leave very little room for the concept art we have come to expect from a Disney Kingdoms volume. A two page spread from Marc Davis and Rolly Crump is almost the full extent of historical artwork we are given. Conclusion: I’ll keep this brief. The Enchanted Tiki Room was high on my personal list to read and review, but it let me down profusely. While there are some masterful artists who have worked on the attraction and this book, there is a scarcity of archival information shared and good art isn’t enough to save poor narrative in this instance. The story itself is so fractured there is very little of the heart and whimsy that have made the attraction appealing to so many for more than 50 years. Released at the end of 2016, this is also the most recent Disney Kingdoms chronicle and, with no news of potential upcoming storylines, the Enchanted Tiki Room may be the tale that halts the presses.